Sprint has partnered with the Taiwanese Smartphone maker, HTC, to launch a new 5G device sometimes in the first half of 2019. This mobile device will utilize the Qualcomm Snapdragon X50 modem to support Gigabit LTE and 5G. Sprint, the American carrier, is set to offer a powerful and an exceptional HTC 5G Hub this spring in the United States. The device was unveiled recently at MWC Barcelona and it is poised to take the mobile market by storm. The HTC 5G Hub allows seamless 4K video streaming for high definition television viewing experience, practically buffer free gaming, lower latency, and hotspot connectivity of 5G for up to twenty users, in a compressed desktop-box of 5-inch display. 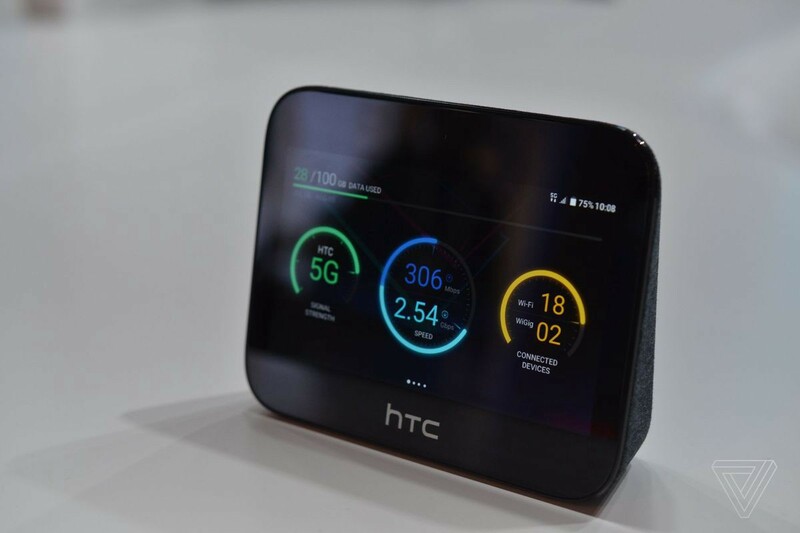 According to the CEO of Sprint, Michel Combes, the launch of the HTC 5G Hub will be a remarkable milestone for the carrier as it brings its customers a wide portfolio of integrated services within the scope of 5G. According to Michel, the Hub is something like a ‘Swiss Army Knife’ that has various tools that makes it versatile and vital for connected small businesses and homes. The device is said to harness the speed future 5G-networks to drive entertainment, content sharing, and gaming, among others. There have been a variety of dynamic opportunities that have been highlighted for the HTC 5G Hub. Looking at it from the perspective of a home media center, the device will utilize 5G speeds of Sprint’s service to stream 4K videos. The HTC 5G Hub will have the capacity to replace Wi-Fi in a home, which removes the redundant cables, replacing it with a simple and straightforward plug and play set up. Additionally, it has intuitive voice command allows for an easy management of entertainment. It also enables user to play their favorite games on their home television. Gamers will greatly enjoy the 4K resolution and lower-latency of up to 60fbps combined with the Qualcomm processing power. The Snapdragon 855 and Snapdragon X50 Modem make for unparalleled data speeds as well as power for PC and Android games that are supported by large screen. Additionally, the HTC 5G Hub is thought to be a crucial business tool for home-based and small businesses. It comes with a built-in 7660mAh battery and gigabit ethernet port that will keep it powered up and connected, in case of in building power issues or remote needs. The device has the capacity to connect up to twenty devices securely and safely on high speed encrypted network. It is essential to mention that it can also be configured for corporate VPN. The Sprint 5G is set to launch in May of 2019 and top among cities where the commercial 5G service will first be offered includes Kansas City, Chicago, Dallas, and Atlanta. Houston, New York City, Washington D.C., Los Angeles, and Phoenix are also part of the locations that the device will be launched in the first half of the year. During the launch, the on-the-go, highly mobile customers of Sprint can anticipate the coverage of mobile 5G within a range of 30 square miles over lower and Midtown Manhattan and roughly 230 square miles covering greater Dallas Fort Worth area. This means that the total initial coverage footprint of the 5G will be above 1,000 square miles over the nine cities.